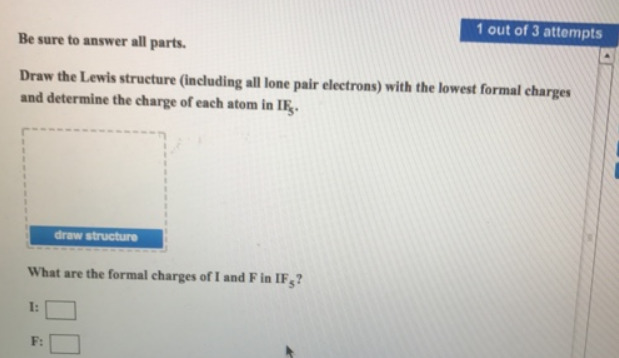 Solution: Be sure to answer all parts.Draw the Lewis structure (including all lone pair electrons) with the lowest formal charges and determine the charge of each atom in IF5. What are the formal charges of I and F of IF 5? Be sure to answer all parts. Draw the Lewis structure (including all lone pair electrons) with the lowest formal charges and determine the charge of each atom in IF5. What are the formal charges of I and F of IF 5?